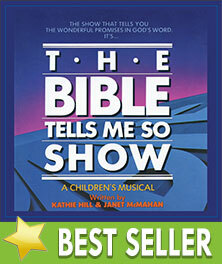 Bible Tells Me So Show : Kathie Hill Music, LLC, Making music with and for kids for over 25 years! The Bible Tells Me So Show books are digital products and can be downloaded as soon as your payment has processed. All other companion products are physical and shipping charges apply. The Bible Tells Me So Show is a vibrant and dynamic musical that puts the promises of God right in front of you, grasping the attention of participants and observers. It is timeless and always "new" in the sense that God's promises never get old or outdated. Thank you, Kathie, for such an anointed musical. Kathie's Note:Don’t know which are better, the songs or the orchestrated tracks! Challenge boys to compete against the girls, have co-ed teams, older kids versus younger, or change out team members in each “round” to create more parts. Originally kids followed Director’s Book instructions to form a “human game board” but now you can use a powerpoint with graphics for each round. Paper sleeved CDs of complete The Bible Tells Me So Show musical with all song and dialogue. Full premiere performance of musical by a children's choir. Does not include the game board Powerpoint now available. Downloadable licensed digital PowerPoint® file containing 86 game & score board graphics for each round & commercial breaks with music & dialogue cues from Singer’s Book. Downloadable pdf of all songs in leadline & script, with permission to make 3 copies . Additional copies require purchase of additional 3x license/s.